I don't know what got into me. Nachos with bacon, cheese and jalapeño peppers as an appetizer, the burrito special and four Coronas. Throughout the night I'd paid the price for that dinner. Or rather my wife had having to put up with my intestinal acrobatics. The air was blue, given my poor wife's comments, not to mention the lingering smell from my hind quarter's activity. And it had been active. Very active. I apologized profusely as I hopped into the bath and tried to relax a bit until the day got under way. But my insides were still in turmoil and this was demonstrated by the bubbles in the water. Did you know bubbles from farts still smell when they break the surface? Amazing, huh? Isn't science something? I towelled off and got dressed. Orange juice, bacon and eggs for breakfast. I wisely decided to skip the coffee. As I drove to work I noticed an emission problem and it wasn't my car. I immediately rolled down the windows, so as not to to be overpowered by the odour. I stopped at an ATM as I was low in cash. I joined the line waiting to use the bank machine. I don't know what it was about the small enclosed space, maybe the dust triggered my allergies, and I could feel a sneeze coming on. AH-AH-AH-CHOO I wailed but having let loose with the sneeze I lost all self control of my nether regions and simultaneously let go a rip-roaring good one. I broke the sound barrier without a plane, a real cheek flapper, a flame thrower, and I immediately thought of that Faulkner piece The Sound and The Fury. As the people in front of me turned around to see who had been practicing the colonic calliope I turned too. I laughed my nervous laughter, pointed at the guy behind me and said, "Please, sir, show a little decency" and fled the ATM cubicle without my money. The moral of the story: if you eat Mexican be ready to pay so. Lmao this is tooooo funny!!! That wasn't cool though, what you did to that guy. Look I am dying! This actually happened to me in a big meeting once. You realize what you've done and hope nobody noticed. Doesn't always work out that way. I did? Hey, this wasn't about me. I just wrote it in the first person. early. That's my story and I'm sticking to it. I would pay so, too, had I indulged in that Mexican extravaganza. Hahahaha, love the build up to this. (Build up.... get it?!?!?!) The Sound and the Fury paragraph is laugh out loud funny. You got it! But then you're used to me by now, Boom Boom. Yep. Laughing out loud....with no sounds coming from my nether regions. Thank goodness! We eat a lot of Mexican food down here. We are locked and loaded most of the time. Locked and load is the worst. That pressure builds up until there's no control over what's let loose. I don't envy you. 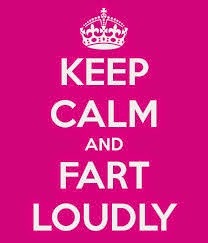 What is it about men (boys) and farts? It's a guy thing...I'm sure of it. It is most definitely a guy thing. I grew up with my dad blaming barking spiders for everything. Barking spiders? Hilarious! And scary. Dang, I thought it was bad enough when one of my earrings fell down my blouse during a meeting.